Mumias' long-hitting Dismas Indiza romped back in awesome fashion on penultimate day of the 2015 KCB Golf Tour to share the lead with Nakuru's Richard Ainley as drama ensured at the par 72 Royal Nairobi Golf Club. Ainley, who went to bed with a massive six-shot lead on Wednesday, was left to rue an excruciating round of three over par 75 which saw Indiza catch up with him on a total of five under par 211 yesterday. "I played 3 over today (yesterday) which wasn't good at all. I need to first of all find out who bewitched me today (yesterday). It was a very rough day for me and I must admit luck wasn't on my side. Its one of those days that everything wrong happens and you have no choice," said Ainley who in 2002 played alongside legendary Tiger Woods and Vijay Singh in the Buick Open in Detroit. Bryan Njoroge was the biggest mover on day three. Indiza and Njoroge of Vet Lab won round three jointly with an impressive round of three under par 72. Njoroge's good show in round three saw him move up from eighth to joint third with Greg Snow. Snow who is an international player has had to play a second fiddle to Ainley who has led from the start on Tuesday. Snow and Njoroge are lying joint third with a total of one under par 215 at penultimate stage. Snow played level par yesterday and is four shots behind the leaders. Indiza was all smiles and promised to remain focused on the last round today. "I know it will be a dramatic day today and the trick is to avoid unnecessary errors," said Indiza who Kenya Commercial Bank sponsored to the recent Sunshine Tour in George's Dimensional Data ProAm and the prestigious Jo'Burg which along with David Wakhu and CJ Wangai fell in pre-qualifying stage. Yesterday's event was being used as a yardstick to asceratin the last four slots for Kenya Open. 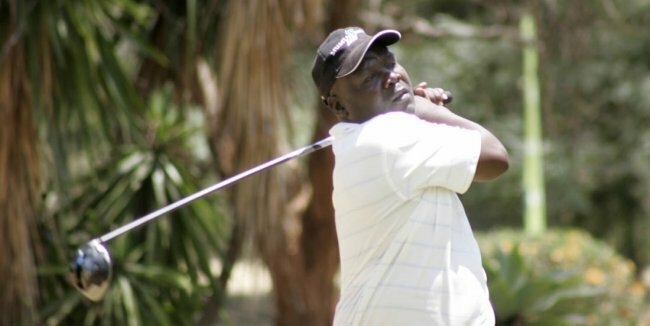 Professional Golfers of Kenya (PGK) had selected an initial list of 23 golfers with four -Stuart Cohen, J. Karanja, Boniface Simwa and Frank Matilo -filling the remaining slots yesterday. Ainley dropped shots on the first three holes and again on holes five and 14. "Dropping five shots was a disaster," said Ainley who parred 11 holes and managed only two birdies on holes seven and 16. Indiza, on the other hand was breathing fire. He sunk in birdies on holes 3, 4, 7, 11 and 15. Ainley said he has no choice but to attack in today's final round. "I will attack everything tomorrow and I mean my word," said Ainley. Thika Sports Club's Simon Ngige was the biggest loser yesterday after he dipped from position 2 to 11. Like Ainley, the Thika man was left to rue a day replete with jinx. "I just lost concentration on the greens from the word go. Some of the 3 puts I made on the greens were very disgusting. My swing was good but tomorrow (today) is another day," said Ngige.